On December 10. 1948, the General Assembly of the United Nations adopted and proclaimed the Universal Declaration of Human rights. This Declaration was proclaimed as a common standard of achievement for all peoples and all nations and encompasses a broad spectrum of economic, social, cultural, political and civil rights. 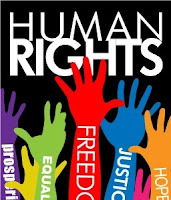 On, or as close to December 10 as possible, the HRD event is held to rededicate ourselves to upholding the 30 Articles contained in the Universal Declaration of Human Rights. Usually, but not always, we have highlighted and taken action on an issue of concern in the Rochester area, related to one of the Articles. The event has a wide spectrum of community co-sponsors. 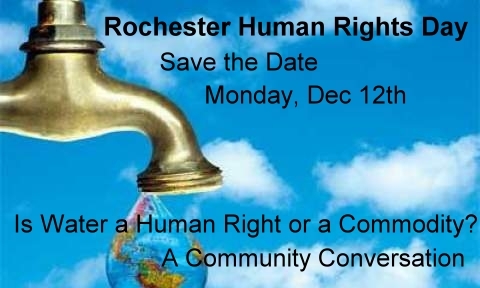 The first commemoration of Human Rights Day in Rochester was organized by the Alliance for Democracy, Rochester Chapter, in 1998, on the 50th anniversary of the United Nations Universal Declaration of Human Rights (UDHR). This event has since become an annual rededication to the UDHR and a time to address and take action on local, national, or international issues that fall under the Articles of the UDHR. 1998 Committed ourselves to work for the day when everyone will experience Human Rights as described in the UDHR. Action: contact President Clinton to recommend Senate ratification of the Committee on the Rights of the Child. 1999 Convention to Eliminate All Forms of Discrimination of Women. 2000 Convention on the Rights of the Child; panel of experts on lead poisoning, environmental toxins, equal education, criminalization of children, fair trade and no-sweat child labor. 2002 Human Rights: Too Much To Ask? Panel consisting of the Director of the UN Association of Rochester, Director of the Rochester and Genesee Valley ACLU, the Gay/Straight Club of Penfield High School, and an attorney working on the case of Jose Padilla. 2003 The Patriot Act: Are They Coming for You? The Editorial Page Editor for the Democrat and Chronicle spoke. 2004 Adequate Housing for All: Connecting Communities, Sharing Stories, Working Toward Solutions, An Agenda For Action. Tour of Poor People United Emergency Bus Shelter. 2006 Health Care For All: A Human Right in the US? Also: The Right to Form and Join Trade Unions: Rochester Crowne Plaza Hotel workers struggle for this right. 2008 School to Prison Pipeline: What factors push young people out of school and into the criminal justice system? 2009 “First Anniversary of World Peace: a scenario.” In this celebration of World Peace Achieved testimonies of world peace included music and dance.